Happy April Fool’s Day!! Hope you are all enjoying this beautiful, spring-like weather! Let’s keep our fingers crossed that it’s here to stay this time! NO more snow! 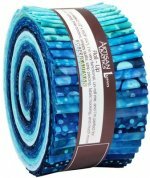 From Kaufman – Check out the new batiks that just arrived – we have yardage as well as jelly rolls of pre-cut 2 ½” strips. These fabrics are gorgeous – lots of vibrant, jewel tones and neutrals. Here's a peek at some of them! 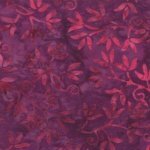 We also have another new batik from Moda – Color Crush Berry. 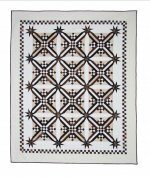 Berkeley Castle by Patchworks Studio also features the Stratford Collection from Northcott. Finished size – 85” x 85”. 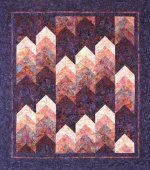 Peeks and Valleys by Mountainpeek Creations is featured using the Stratford Collection from Northcott. Pattern has directions for throw, twin/double, queen and king. 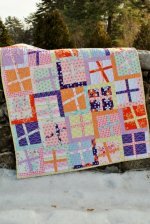 Savvy by Rachel Griffith Designs provides directions for a 65 ½” x 65 1//2” quilt. 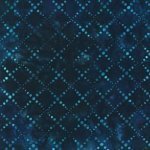 Plus One by Sweet Jane’s Quilting & Design is a fun pattern with directions for baby, lap, twin, full/queen, and king. 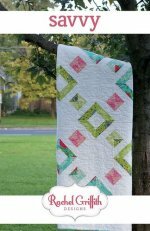 This pattern is quick and easy and great for scraps! Sharynn’s Stitching Friends. The next meeting will be Saturday, April 19, 2014 at 9:00 am. We had to move it to the 3rd Saturday of the month for April. Be sure and bring Show and Tell. Rose is once again holding classes that demonstrate how to use the different feet for our sewing machines. The next class will be Thursday, April 17 from 5:00-6:30 pm. She will be showing us how to use the ribbon and sequin feet. The next session for the Kansas Troubles BOM will be Tuesday, April 8 from 1-3 pm. The BOM will meet the second Tuesday of each month, for 6 months, ending in August. 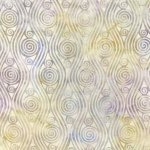 Learn the kaleidoscope technique and use the blocks for a wall hanging or quilt. The class will meet on Tuesday, April 29 and Tuesday, May 6 from 5:30 – 8:00 pm. Margaret Large is the instructor. Stop by the shop or call today to sign up for this class. The Charming Shop Hop was a huge success! As always, it was good to see lots of shoppers from past hops and good to meet lots of new shoppers. Sharynn’s Quilt Box Gift Basket winner is Brittany Gusler from Illinois. A Big Thank you to all our shop hoppers and congratulations to all the prize winners! Hourly drawings for door prizes. 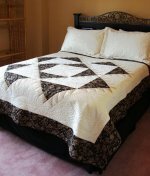 Quilt Supply Vendors will be at the show. Hand-made quilt to be raffled with a drawing on Sunday 4/13/2014 at 5:00 pm. Proceeds go to High School Scholarships in Jefferson County.